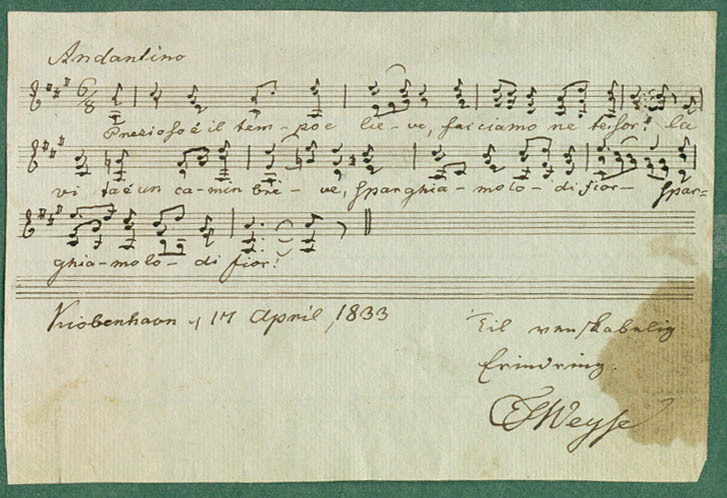 Just before Andersen left for Italy in 1833, Weyse wrote a canon for three in Andersen’s Album. The text runs: “Prezioso è il tempoe lieve, facciamo ne tesor! La vita é un camin breve, sparghiamolo di fior!” dated 17th April 1833. In the notes to the published edition of the Album, the text is translated into Danish as “Precious is fleeting time, let us therefore treasure it! Life’s path is short, let us bestrew it with flowers”.